A water slide is outdoor fun for the whole family! Pool slides are a great way to maximize your enjoyment of your Maryland pool. 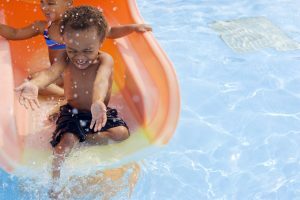 Whether your pool is already built or you are just starting the planning stages, here are three of the biggest things you need to know about pool slides in Maryland! If you have an existing pool and want to add a pool slide, that’s perfectly possible. Make sure that you have plenty of space around your pool and patio for the installation. Make sure that your pool also has a water source that is roughed in and capped so that you can use it. Pool slides draw water from the pool itself to use, so make sure that you have the existing plumbing in effect. Pool slides need to be installed at the appropriate place in your yard so that water can go down the slide into the pool, without too high of an incline. The right location should give your Maryland pool slide plenty of space. What size pool slide do you want? The bigger and longer the slide, the more space that you will need to allow. Most pool slides are installed near the deep end of the pool so that you won’t be in danger of hitting the bottom of the pool when you slip down. Pool slides are available in many different styles and varieties with twists, turns, and straight shots. Depending on your interest, you can choose a fancy and elaborate slide or something simple that will perfectly complement your Maryland pool. There are countless pool slides available at a huge variety of price points, so don’t worry that you’ll be priced out.